As of today, the Central Securities Depository AD Skopje is launching its latest project for digitalization of end-user system, i.e. the issuers and investors. The digitalization is in the form of internet portal intended for access to electronic reports which quickly and easily obtain important information for the investors and the issuers of securities. The internet portal is made according to the users’ needs and it’s very easy to use. In addition, the portal offers the opportunity to receive free, relevant and reliable reports, reports which are charged and reports which are verified with electronic signature and a time stamp. The holders of securities can obtain initial access data through the banks or brokerage houses that are members of CSD AD Skopje and have concluded a special Agreement with CSD AD Skopje for this purpose, while the issuers of the securities obtain this kind of access by signing an Agreement with CSD AD Skopje for usage of the distribution system of CSD, whereby an authorized person of the issuer (or legal entity) gains an access to the internet portal. During the development of the internet portal, highest IT security standards and personal data protection policies were applied. “Developing the portal was a selection process of the end users’ needs, while the web application itself was created based on many experiences and best practices. From now on, the joint-stock companies as well as the investors will have an easier path because the digitalization of CSD AD Skopjewill save the crucial resources, both time-consuming and operational while protecting the affected entitieswhich includes approximately 530 issuers and 70.000 shareholders” – said Darinka Damjanovikj, CEO of the Central Securities Depository AD Skopje. The Central Securities Depository contributes to more efficient operation and modernization of the securities market, while the migration from offline to online is a natural process which will result in cheaper services for each user. The digitalization towards the end users was co-financed by the European Bank for Reconstruction and Development (EBRD). The 12th annual World Exchange Congress was held in Budapest on 29th and 30th March 2017. For more than a decade, the World Exchange Congress has been bringing together the global exchange community to examine strategy, opportunities and challenges within the finance industry. This year, the World Exchange Congress brought together over 200 industry leaders from more than 60 countries. The Central Securities Depository AD Skopje CEO Ms. Elena Jakimovska Petrovska had the honor to be a moderator of a roundtable session “The role of post-trade infrastructures in 2017”, and panelist in the discussion “What should post-trade infrastructures be doing to help develop markets”. 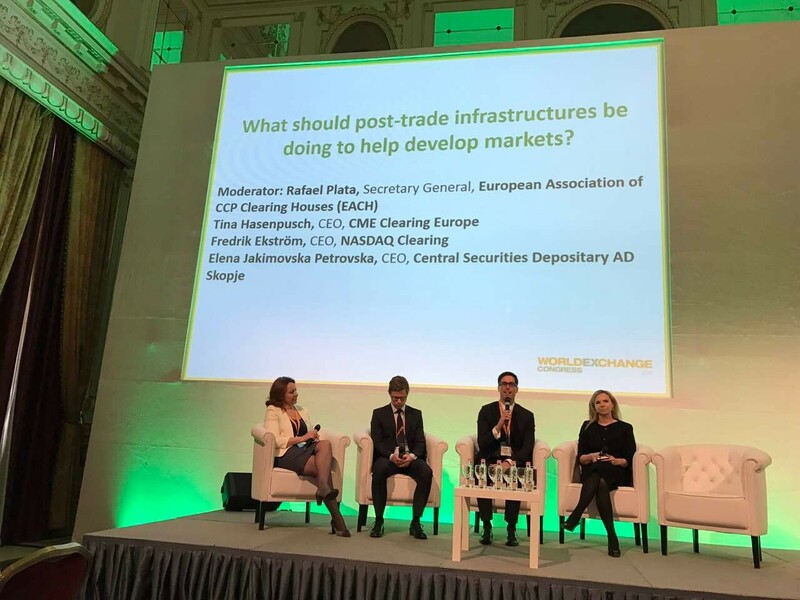 The Congress was focused on the most critical future trends affecting the securities markets and therefore was a great opportunity for CSD AD Skopje to be part of the discussions that are expected to change the face of the securities markets landscape and to prepare itself for the challenges ahead. In accordance with the Decision of the Government of Republic of Macedonia for the implementation of the action “Tree day - Plant your Future”, 30.11.2016(Wednesday) is non-working day for the Central Securities Depository AD Skopje.